Meridian Stress Assessment (MSA) is used to conduct a comprehensive evaluation of a person’s energetic health and balance. Non-invasive sensitivity screening. NO scratch testing or injections are necessary. Nutritional evaluations can help patients who are looking for nutritional balance. Consider possible complementary approaches that may help a patient achieve a more balanced energetic state. Identify specific dental stressors that might contribute to health problems. Test for toxicity and drainage levels, and their effects on energy and organ functions. Help patients maintain the structural or functional integrity of important systems. This process involves measuring electrical conductivity at responsive points (meridian points) on the skin – typically on the hands and feet. The locations of the test point generally correspond to those of acupuncture points. Acupuncture points have been known for thousands of years, and it has been known for many years that acupuncture points have different electrical conduction than the surrounding tissues. 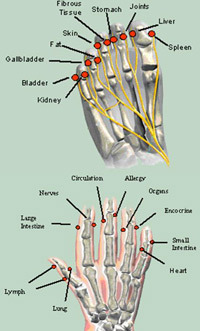 According to European medical research, acupuncture points are related to the body’s organs and organ systems. Major groups of points are connected through channels, or meridians. Twenty of these meridians begin or end on the hands and feet. These measurements are recorded to help provide a profile of a patient’s present condition. Changes in these electrical readings in conjunction with disease states has been investigated extensively. Testing does not involve needles, a stylus is used to send a very small electrical current (not a shock) through each point, which is recorded and analyzed by the computer system. After the initial measurements have been taken and recorded, the results can be reviewed. If stress values are above or below equilibrium= health, the System’s extensive computer database will allow consideration of a wide range of possibilities that might help the patient regain a healthy balance. The MSAS allows consideration of thousands of herbal, homeopathic, and nutritional products. Meridian stress assessment instruments have been around for over eight five years and have been used widely in Europe and around the world for allergy testing as well as for a variety of other purposes. Meridian stress assessment instruments have been manufactured in Germany, Japan, China, France, Denmark, Russia, and more recently in the United States. For more information please call our office at (661) 254-9400. Serving Valencia, Santa Clarita and Canyon Country.